Enough of your handling tomfoolery! As a bunny owner, one of your biggest challenges may be handling your rabbit. This is because oftentimes, rabbits don't particularly like to be held, which means that they struggle, growl, and occasionally bite and scratch. Even if they do these things however, that doesn't mean you shouldn't handle them. It does mean that you will have to take some time to establish a better bond between you and your bunny. This is a guide for the beginner bunny owner and takes you through the first steps of handling your rabbit. Pet your bunny. You have to walk before you can run, and petting your bunny is the first step towards being able to pick it up and handle it. Bunnies like to have their heads gently scratched and rubbed, but they generally do not like to be touched under the chin or around their hind quarters. If you want to earn your rabbit's trust, giving it a gentle head rub is an excellent way of doing that. After a while your rabbit may even start running up to you and demanding that you pat it. Put the bunny in your lap. Sit on the floor with the bunny and gently put the bunny in your lap. Let it run off if it wants to, but let it get used to the idea that being picked up and put in your lap is not the end of the world. If you cannot pick your rabbit up at all, try luring it into your lap with treats. Try holding your bunny. Odds are that your rabbit will not like being restrained. Remember, these are prey animals, and to them, being held down or trapped by a bigger creature often means death. Is there really any wonder that they fight so hard to be let go? Bonding with your rabbit in the first two steps, and being gentle but firm when you do pick the bunny up will go a long way to helping your bunny become more amenable to being picked up. Hold the bunny close to your body. Let it rest against your body if you can. This will provide it much more security. Once you've picked your bunny up, hold it for a few seconds, or until it stops struggling, and then release it gently. Rabbits will often start struggling again when they feel themselves being released, so make sure you do this very close to the ground. Giving the bunny a treat may sweeten the experience as well. Beware that once you put the rabbit down it may try to bite you for your effrontery. This is where fast feet (yours, not the rabbit's) come in handy! I jus got my bunny today!! !it is jus precious.i have some other bunnys that I got last year and I tried to put my new bunny with it but they were mean to it!! what do I do? I also need a name bad!! I meant I am going to get him fixed not spayed! oops! and Latte loves riding in my bike basket when I ride my bike! I put her harness on her and I have a basket made for animals so they can't jump out or get hurt!! All my bunnies love being held. Especially Mimzy. She is a Flemish Giant/Harlequin and she LOVES people! She jumps on my lap when I sit on the ground and she can be loose in the yard cause she just follows me.She is litter box trained and knows her name! When she is in her cage and I open it she stands on her back legs begging me to pick her up and I can carry her everywhere. My bunny Lu Lu who is a Holland Lop he doesn't scratch or bite but he pees on me every time I pick him up LOL! and Latte is my lionhead and she is very tame she used to be a class pet at our school for a year but then I got to keep her so now she won't ever scratch or bite! Lu Lu likes to sleep on his back with his feet in the air behind my pillow! EVERY DAY HE DOES THAT! its sooo cute and funny! I am getting another holland lop in the morning we go to get him. Once Lu Lu is older I am going to get him spayed. He is only 8 weeks and 4 days! Mimzy is 7 weeks and 4 days and Latte is like 3 years I think!! I hope this works with my rabbit he kicks like a bronco! i have 7 bunnies right now and all of them just love me. iv never had a problem with my bunnies after like the first day. they are all very sweet bunnies and are never scared to be held unless they don't know you. we gave a bunny to my boyfriends moms friends and i went crazy with these thoughts like is she gunna pick her up right if she scratches will she drop her. and so far so good iv hurd, but a lot of this stuff really depends on the rabbit, some bunnies will just be mean no matter what. i was so lucky to get the bunnies i have because they are the sweatest things.! My little buck, Maxie, is a pretty tame bun and we have bonded quite well over the past few weeks, at first he moved away when I tried to pat him but now he nudges at my hands and wants me to pat him! He's also started binking which is way too cute, and the funny thing is, he binkies when he knows he's being cheeky! I covered the little space under the couch with a blanket so he can't get in but he learnt how to burrow his way through so every time he does I just tap the blanket right next to him, or interrupt him by gently shooing him away and at first he understood to stop but now he enjoys it or something! But that's not what I wanted to say haha, we're well bonded and he's adapted quite well to his surroundings and learned to live with my mother even though it's rather obvious Maxie doesn't like her, but the only problem I have is picking him up... Iv'e tried this for days and used the same kind of technique I used to bond with him but he absolutely hates being picked up and I want him to get used to it because our vet is rather rough and Maxie always seems angry with me for HOURS when we get home, especially if the vet picks him up and it breaks my heart because I love him more then the world and I just want the best for little Maxie, I just don't know how to get him used to being picked up? wow thank you how do you know so much this will help me and Cuddles relationship a lot! My bunny Delilah (3 months) is starting to bite and scratch and kick I don't know if I'm not graving her properly....she was really nice and wouldn't bite but now she bites what do I do can you help? I read all of this but she still wont let me hold her. When I put my hand under her she runs away really fast so I cant get a hold of her. Any advice? i already know all that stuff!!! im wondering when u let it out for fresh air, how to not let them hop away?! my rabbit reggy is not used to being handled he used to kick me ever since he was 14 weeeks old . which was when i bought him.i was really scared so over the years he has only been stroked he still wont let me pick him up to date. any advice ? i loove him he is my world! Ive got a 12 weeks old mini lop,Harryhe sometimes likes cuddles but sometimes he will headbut me! At first.. he wouldn't let me carry him, he would struggle when carry him... So, i won't carry it ever since... Everyday, i spend time grooming him, playing with him... I thought him how to play football!!! Until one day, i tried to carry him... i was so shock he let me!!! I hold him for hours and he didn't struggle! He managed to sleep in my hands!!! I was so happy that he finally trust me!!!!!!!! My bro get so jealous as his female rabbit won't let him handle her!! lol. Surprisingly... my little bunny wouldn't let anyone handle him except him... Im really happy about that, hah!! my rabbit allways scraches me when i pick him up.i have had him one week yesterday (monday) and he is 10 weeks old.he is a lionhead called parsley. he is in the run at the moment but im scared to carry him to his hutch even though its not verry far to the garage but i now put him into a hampster cage ( that is big enough for him at the moment) with some straw in it and a carrot so he can munch on it when its the guinnea pigs turn to go out first although he doesn't mind being in there as he will actually sit in it without moaning. this is very helpful im going to try it out now thanks x !!!!!!! should get. I want 1 that works well with ages 5-any age. I didn't even know that bunnies don't lik to be held! My bunny is fine w/ me holding her! my bunny loves to be held, he even bury's his head in the crease of your elbow. he loves it and so does my other one! but he kicks a lot. my bunny farts every time i pick it up what is wrong with it!!!!????!!!! how can i tell how my bunny is a boy or girl? Hi. I think, if you'r rabbit is struggling, then you may be holding them too high. Rabbits don't like hights and so if your holding them too high tey will struggle. It is best to sit down with your rabbit. I hope I helped. Hello i own three rabbits and one had babies.I was wondering how old do the baby rabbits have to be before i can hold them? Thnx! =) ? your info! I have a 14 month old Dutch rabbit named Custard. He loves to be petted, and loves having me around. He also always let me hold him until I got him neutered. Now he hates being held, he's never bitten me, but I do get scratched when I try to hold him. Do you think he didn't like the vet, and remembers what happened the last time I held him? A good way to move around with your bunny is to put his/her head under your arm, or in your armpit. That way, he/she can't see, so he/she won't be trying to jump out of your arms at all the commotion around him/her. I have a 24week old Papillion rabbit that i brought from the pet shop about a week ago now... he is the most friendlest rabbit you would ever meet, he jumps on the sofa and comes and sits on my lap for a fuss, but he will not let you pick him up he struggles a lot! ( but never bites or scratches). how can i get him to let me hold him? I found this very useful,my bunny doessnt even struggle when I pick her up. I am getting a bunny and this is exactly the kind of info I am looking for to really make a good first impression to my bunny. are bunnies easy 2 take care of? You MUST wait at least 3 days. give your new bunny a chance to look around and to feel safe. then you can lightly pet it if it lets you, and then you can try to handle it. I have just bought a rabbit my son is scared of all animals so I was hoping a cute rabbit will help, It does seem to, but i really need to ensure that it will allow us to pick it up and cuddle it, I have been told to not handle it for the first 48 hours is this correct? or shall i handle it as soon as possible? can anyone advise me? my 3 rabbits pepsi,shurley and fifi never let me pick them up they allways just run away from me.i want to pick them up and rub them .and when i pick one up it scratches me so i have to put it back .AM I HOLDING THEM WRONG WHAT DO I DO ??????????? I really hope this works with my bunny (Shadow)! She is black with some dark brown on her forehead, has brown eyes, and shell let you rubb her head forever! She's soooooo sweet. And her fur is very soft. Shell be the sweetest bunny in my life. And if she dies she will be forever loved, and will never be forgotten. I LOVE SHADOW! I really like her! I wish I could show you her. MY RABBIT (THUMPA) LOVES BEEN RUBED ON HIS HEAD AND EARS AND COMES TO ME FOR TREATS, THE ONLY PROBLEM I HAVE IS HE DOESN'T LIKE BEEN PICKED UP, SO I HOPE THIS WILL HELP. thanks sooo much for the info it has helped in every way i just got the bunny yesterday and now it loves me! Yes, I do all this. But my bunny, whom I love very much, still won't come out of her hutch! She just runs to her box when I try to, gently, scoop her up! HELP! Wow- what great advise! My 2 female dwarfs are just 4 weeks old- Coco (my brown rabbit) is so-so with me... I can't tell what shes trying to say! Millie ( my black & white) is so afraid- even if I open the hutch! Ya, know i have a bunny (Shadow) and she always scracthes me when i pick her up!!!!!!!!!!! Today she scractht me sooo hard that i needed a band - aid!!!!!!!!!!!!!!!!!!!!!!!!!!!!!!!!!! I hope this works; my bunny Toki loves a head rub and treats, but when it comes to being held, my hands are covered in scratches. my rabbit and i have a great bond she is very sweet but she does not like to be held she'll come on my lap sometimes but at her own will and leaves when she wants when i try and pick her up to do her nails she freaks out (she's never bit or scratched but im afraid she'll hurt herself) i need to cut her nails they are way too long and she has already snagged them. I've had her a while and am ok with the fact that rabbits don't like to be held but for her sake i need to in order to cut her nails im gonna give it another try this time with my husband's help and i hope i can before she snags another nail (what can i do about the snagged nail?) I feel like a neglectful bunny-mom b/c her nails are ridiculous but she's stubborn and i'm likely to clip her if she wont be still for 2 seconds let alone 5 mins! Other than this my 2 rabbits are perfect they are so easy and sweet we truly lucked out but they wont let us do the things that is for their own good! I posted this on another board, but wanted to share it here also. I know the article says they don't like to be restrained. Mine however likes me to hold her if she's wrapped in a towels. With her head sticking out! She prefers this as I think she feels secure. Just my opinion! Wow it realy works my bunny harry dosnt scratch when we pick him up anymor!!! 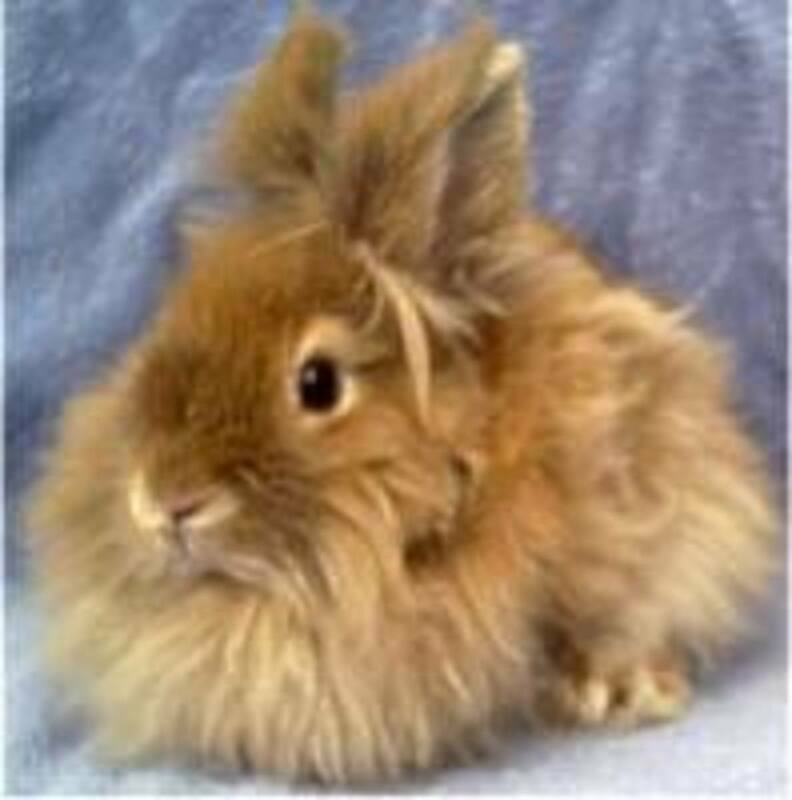 hI I WONDERED IF U CUD HELP, IV HAD A LION HEAD RABBIT 4 ABOUT 3 WEEKS, BUT THE TING IS MY STEP BOTHER HAD ER 4 A MONTH B4 HAND N I DON'T KNOW IF I CAN TRAIN ER, I DON'T KNOW IF ES NOT BEEN VERY NICE 2 ER. DATS Y IV AD ER. SHE IS MORE RELAXED, LOVED A FUSE CUZ WEN IN CAGE FOLLOWS ME ROUND DA ROOM WEN SHE SEES ME UNTIL GIVE ER A FUSE, BUT WEN IT COMES 2 BIN HANDLED SHE WONT LENT ME NEAR, SHE'L LOVE A FUSE N STROKIN BUT ONCE IV DUN DAT 4 BOUT 15 MINS N SHES CALM SHE WONT LET ME NEAR ER WEN I GO 2 PICK ER UP N JUS PANICS, JUS DON'T UNDERSTAND HOW I CAN GET ER 2 LET ME PICK ER UP,SHES EVEN GONE 4 ME AT POINTS N ALWAYS TRYS 2 RUN OUT CAGE, PLEASE HELP. my bunny used ot be calm and peaceful when i bought her form a friend, but when i got her shes become angry and a bit wild. I don't think i spend enough time with her when i got her. When i just got her (lilo) i always coud pick her up and then i only could sometimes and now never. If my hand even goes under her, she jumps and becomes all angry. She tears up the newspaper in her hutch and tips over her food bowl. HOw do i make her more tame??!?!?!?!?!? Thanks hope my bunny will let me she is 4 months and bites me and so all my familiy are scared to pick her up so hopefully this will help. Flame (my rabbit) always bites me when i pick him up i try and do this but it doesn't work! Am i holding him wrong. I really want to take him outside but i cant pick him up! i hope it works i always try to pick up chico (my rabbit) but he just kicks and runs away. I currently own a neutered male mini lop pretty boy and a baby bunny that I just got the other day, I plan on bonding the two my baby girl (precious) gets used to her surroundings. 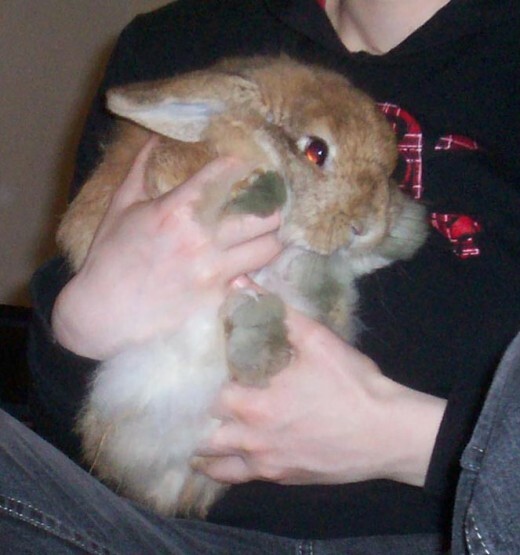 But my biggest problem I had with my male rabbit is that he just hates being held, hate is not an understatement at all lol, when I fist got my boy pretty boy I researched allot on the net because he was my first rabbit. What I took from many pages is, to wait to hold your rabbit until you establish a good bond. So I tried to hold pretty boy as little possible and now.. Pretty boy and me have a great bond, he lives in my bunny-proofed bedroom and has a litter and cage open for him to come and go as he pleases. When I enter my room he comes running to my feet and begins licking me lol whenever he can groom me he does. He also lays beside me at allows me to pet him as much as I would like, he even does a light purring grinding sound when he is being petted. And about twice a week he walks around me buzzing. These are all really great things so I read that my rabbit loves and enjoys me and we have a good bond. However he will never hop into my lap if I place him there he hops out and turns around angrily lol. He will however put his to front paws on me or will sit on my feet. The biggest problem I am having is holding him. I was hopeing it would go smoothly because he seems to really trust me now. When I pick him up he struggles then calms for about 10 seconds and struggles again sometimes he will even put his ears back witch scares me because he is so STRONG lol. When I place him down he thumps is foot at me and gives me the feet flick and gets distance from me. And in a matter of min he is beside me again like nothing happened. I just cant wrap my brain around why he does not trust me to hold him and what I can do to maybe get him to enjoy it more. He is not getting any smaller and when he is an adult I fear I will have no chance in picking him up for meds and other things I might need to do. Now that I have a new bunny I wonder if I should do anything differently? Maybe hold her more but I don&rsquo;t, want to ruin our bond before it begins she is only about 8 to 9 weeks old. Within having her out for 5 min she was in my lap climbing me and sniffing me. Complete opposite from pretty boy who was very distant, wouldn&rsquo;t come near me I spent a month on the floor talking to him and trying to pet him when he came close enough and of course bribing him lol. And all went good but it was a slow process of gaining his trust. I am very shocked by my new rabbit&rsquo;s curiosity and friendly she is not skittish towards me at all. Just when I hold her lol. So sorry for the long message, if anyone can help me out please do J I would love to know what I can do or what I am doing wrong. I LOVEE BUNNIESS!!! and this bunny i have doesn't like to be picked up often i think thats okay and if your bunny is liike that no need to have your bunny become upset or put in a position it doesn't like. the key to this is just listen to your bunnies likes, and bunnies are the cutest ever if you cant pick it up more than once a day whatever you have an ADORABLE Bunny! yea i hope this works with Raynn (my bunny)! Great! I am glad it is helping you. Keep in mind that some bunnies never really like to be handled at all, but even a bunny that hates being picked up can become a huge fan of gentle head rubs, which build trust between you and your bunny. Im about to try this with my rabbit.